Seneca the Younger, “Epistles“, 1st Century CE. Paul of Tarsus, “Letter to the Romans”, 1st Century CE. Romans 14:2-3. Jerome (attributed), “The History of the Monks (Fr Theon)”, traditionally 5th century. Now the story has reached characters whose writing survives to the present in volumes, I’m spending less time talking about historical sources and more time quoting people. And it’s hard to leave things out. There are so many things that Plutarch said in the first century that people like Vegan Sidekick have had to repeat in the twenty-first. This was also the hardest episode for which to arrange a location visit; the story unfolded a long way from where I live, there’s not enough reason to travel, and precious few ethical vegetarians. It took me a while to find the monastery of St. Athanasius. 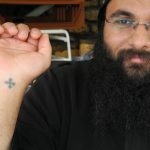 The tattoo of a Coptic cross on Fr. Yostas’ wrist is what modern Copts (Egypt’s Christian minority) show on entry into a church. Music by Robb Masters, and Michael Levy. The actors were Jeremy Hancock and Yasser Sha’aban. 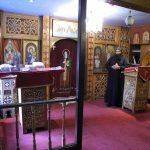 The show also included part of a service at the monastery of St. Athanasius, and (at the end) an Ethiopian Orthodox Service at St. Mary of Tserha Sion in Hackney, East London. 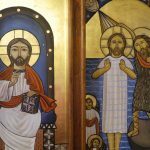 The icon of St. Nofer the hermit is taken with permission from this Russian-language tourist website. Special thanks to the Coptic Monastery of St. Athanasius, and Marian and Kevin McDonald (my parents) for driving me there. Geek recommendation: some of the Christian theologians in this episode also appear in the excellent (and uncharacteristically monster-free) Doctor Who audio drama Council of Nicea.